Since moving to New York, I have had the great pleasure of producing cabaret in top venues in the city. Here you’ll find information about the shows I’ve put together. I am available to produce and/or direct your cabaret show as well. Please contact me for more information. Sondheimas, falling on March 22nd, commemorates the Great One’s birth much in the manner of another perennially single Jewish boy whose world view was, let’s just say, a lot less wry. Direct from the (electronic) pages of Rachel Shukert’s Kindle single “Let Me Be Your Star,” and the (electronic) pages of the “F*ck Yeah Stephen Sondheim” Tumblr, came the world’s first celebration of this holiday for the ages. One part concert, one part hilarious worship service – our Sondheimas celebration featured the premiere of Shukert’s pageant retelling the Birth of Steve as you’ve never seen it before, a homily by award-winning author/Broadway dancer Tim Federle (author of Better Nate Than Ever, dancer in Gypsy) and Sondheim songs familiar and rare, performed by Broadway talent including Molly Pope, Leah Horowitz (Follies), Terry Burrell (Dreamgirls, Into the Woods), Tamra Hayden (Cabaret), Justin Barnette (Hairspray, Fiorello! at Encores!) and the Sondheimas Tabernacle Choir. Audiences made like the (Franklin) Shepards and Wise Guys, and followed the greatest star Broadway has ever known to 54 Below in honor of this great day. The truly luckygot called on stage to help decorate the holiday beanstalk and sit in the festively decorated barber’s chair and tell Sweeney Todd about their Sondheimas wishes. With better songs than The Greatest Story Ever Told and more laughs than The Passion of the Christ, audience members will tell their grandchildren that they were there the day Sondheimas was first celebrated. Produced by David Levy. Musical direction by Jose Simbulan. 54 Below – Sold out! Sondheimas is the annual quasi-religious celebration of the birth of the savior of musical theater, Stephen Sondheim. The team that brought you last year’s sold-out show at 54 Below returned with another raucous celebration of the man, the music, and the mythos. Expect songs familiar and obscure, irreverent schtick, and a warm holiday feeling that can only come from a gathering of the faithful celebrating together. Featuring Kurt Peterson (Follies Original Cast), Liz Larsen (Beautiful), Ariana DeBose (Hamilton), Molly Pope (Found), Nikka Graff Lanzarone (Women on the Verge of a Nervous Breakdown), George Abud (Allegro), puppeteer Scottie Rowell, Larry Owens (Fat Camp), and Playbill’s Robbie Rozelle. Produced by David Levy and Maggie Larkin. Musical Direction by Andrei Strizek. Amy Spalding is a professional author, not a professional singer, but that wasn’t going to hold back her dream of starring in her own cabaret show! Amy presented an evening of songs, a dramatic reading (or two), and special guests to celebrate the release of her third young adult novel, Kissing Ted Callahan (and Other Guys). Singing Ted Callahan (and Other Songs) celebrates the exuberance of being a teenager, when the line between living your garage band dreams and being totally self indulgent by staging a cabaret show in a real Greenwich Village venue is, shall we say, permeable. Amy was joined by three performers who also know their way around a word processor: Tim Federle (former Broadway dancer and author of Tommy Won’t Stop, Better Nate Than Ever), Will Reynolds (composer/lyricist of The Greenwood Tree, Poems & Moon Songs, Radioactive and performer in Passion, Mamma Mia! ), and Jill Twiss (writer for Last Week Tonight with John Oliver). The evening featured musical direction by Christie Baugher, and is produced by Adam Grosswirth and David Levy. The Germans call it “Ear Worm,” the French “Stubborn Music,” and the Italians “Tormenting Songs,” but in any language the phenomenon is the same: a song gets stuck in your head and stays there, burrowing its way into your subconscious until all you can hear is “Jellicle Cats” over and over and over again. We are here to help. Research is underway to help victims of this unbearable malady, and our show of support can make a difference. We gathered a team of expert performers to help us explore what makes an earworm — and what we can do about it. Featuring songs from Broadway, film, and the radio, this show had the audience tapping their toes for a good cause — and absolutely didn’t have them humming these songs for the rest of the week, we promise. Brought to you by the team behind SONDHEIMAS: producers Maggie Larkin and David Levy and music director Andrei Strizek. Come back with George Abud as he delves into the rich rarities and forgotten triumphs of America’s musical, theatrical, and comedic treasure chest. Told all too often that he was born in the wrong era, this Broadway Baby shows you why he is right where (and when) he ought to be. Fresh from his main stem debut in The Visit, George brought his old soul and fresh outlook to the cabaret stage. Celebrating a dazzling mélange of tunes and talents from days past, this show dove into the lesser known gems of Loesser, Porter, Rodgers & Hammerstein, Comden & Green, Kander & Ebb, and many more interspersed with the snappy, sharp wit of the likes of Jack Benny, George Burns, and the Marx Brothers. George further explored his own unique Lebanese heritage with original arrangements on the Oud, including his now celebrated version of “Children and Art” about which Sondheim said, “I was moved to tears.” Joining him on a swinging song or two were his dear friends and co-stars from The Visit and Allegro, Tony nominees Mary Beth Peil and Elizabeth A. Davis. Produced by David Levy. Musical direction by Jose Simbulan. In August 2014, two crazy people had a thought: “Could theater reviews be both informative and entertaining?” The answer was “Yes!” and also “Oh god, what have we done.” At the beginning of each episode of Hot Pepper Theater, a reviewer eats something incredibly spicy—usually either a pepper (habanero or hotter) or a shot of hot sauce—then attempts to review something playing in New York. Only once they have finished their review and rated the play, and pepper, on a scale of 1 to 5, may they drink milk to relieve the pain. 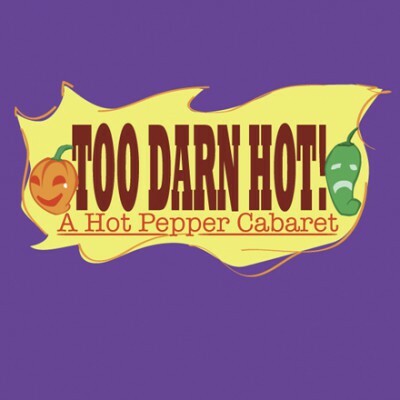 With our first birthday coming up soon, we’re leaping off the screen and onto 54 Below’s stage for TOO DARN HOT: Hot Pepper Theater LIVE! And we’re turning the tables: we’re making the performers take the heat. Can a Broadway belter defy a Scotch Bonnet while she’s Defying Gravity? Will a drop of Ghost Pepper Hot Sauce make a juggler drop his pins? How much heat turns a Durang monologue into a real Actor’s Nightmare? Those who joined our brave cast of guests from across the world of theater, cabaret, and burlesque found out as each tested their mettle and spiced up the night. Hot Pepper Theater was created and produced by PowerOut co-founders Todd Brian Backus and Ben Ferber. Music Direction by Ian Axness. Co-Produced by David Levy. With mad props to our inspiration, Hot Pepper Gaming. Sondheimas is the annual quasi-religious celebration of the birth of the savior of musical theater, Stephen Sondheim. The team that brought you last year’s sold-out show at 54 Below is back with another raucous celebration of the man, the music, and the mythos. Expect songs familiar and obscure, irreverent schtick, and a warm holiday feeling that can only come from a gathering of the faithful celebrating together. Featuring an all-star cast of Broadway’s best: George Abud, Brittain Ashford, Ariana DeBose, Ali Ewoldt, Jason Forbach, Aaron David Gleason, Olli Haaskivi, James Jackson, Jr., Nikka Graff Lanzarone, Larry Owens, Martha Plimpton, Molly Pope, Joseph Spieldenner, Alex Wyse, and the Sondheimas Boys Choir: Steven Cuevas, Sean Doherty, Matthew Lummus, Michael Anthony Walsh, and Eric Williams, plus special appearances by Laura “BroadwayGirlNYC” Heywood and Natalie Walker. Produced by David Levy and Maggie Larkin. Musical Direction by Andrei Strizek. Come melt into a dream, come fade into fantasy in a musical evening of class and pure delight. Join your personal master of ceremonies, George Abud, in a cabaret journey through the days of Fred Astaire and Bob Hope to Sammy Davis Jr. and Vic Damone, as a Broadway Baby searches for his true voice and his true love. Together with a dazzling parade of Broadway’s best and beautiful ladies, George will glide through tender tunes and dishy duets too often unheard from the brilliant minds and fingertips of Jule Styne, Newley & Bricusse, Johnny Mercer, Strouse & Adams, Livingston and Evans, the Sherman Brothers, Stephen Sondheim, Sammy Cahn and many more. With choreography by Michelle Veintimilla, a first-rate band, and featuring a dozen of New York’s finest talents this will be an evening not to be missed. Press those bow-ties, dust off those gorgeous gowns and come spend your holiday with us. Change Partners will also feature Michelle Veintimilla (The Visit, “Gotham”), as well as Hannah Corneau (Daddy Long Legs), Elizabeth A. Davis (Once), Diana DiMarzio (Sweeney Todd), Erica Knight (The Nether), Maggie Lakis (Allegro), Nikka Graff Lanzarone (Women on the Verge…), Megan Loomis (Gentleman’s Guide…), Emily Mechler (Wicked), Erin Neufer (Nathan The Wise) and Jane Pfitsch (Cabaret). Why would a Baltimore-bred black man bond with buxom Broadway beauty Bernadette Peters? Find out as Larry Owens (Gigantic, A Strange Loop) explores music from the diva’s extensive career on stage, screen, and record. Larry was joined by guest stars Ashley Blanchet (Beautiful), Derek Christopher Murphy (Wolf in the River), Heath Saunders (Natasha, Pierre, and the Great Comet of 1812), Jenny Lee Stern (Forbidden Broadway), Vishal Vaidya, and Natalie Walker. He was backed by the Bernadettes (Erika Conaway, Lily LaGravanese, and Tam Young) and the Andrei Strizek Trio. Dating is funny and improv is hard. Or is it the other way around? One lucky single goes on a date with 4 perfect suitors….at the same time! Part improv, part experimental theatre, this parody of the gone-but-not-forgotten reality show ElimiDATE featured 5 actual New York City singles dating each other live on stage! Co-produced with Sara Beth Berman. Sponsored in part by Beecher’s Handmade Cheese.